It’s been a while since I wrote to you and I feel terrible for being so absent during this month, April did not go exactly as I thought it would. This month started really well for me because I took some days off and went to a Comic Con in Belgium with my husband and 2 friends who live in Paris. 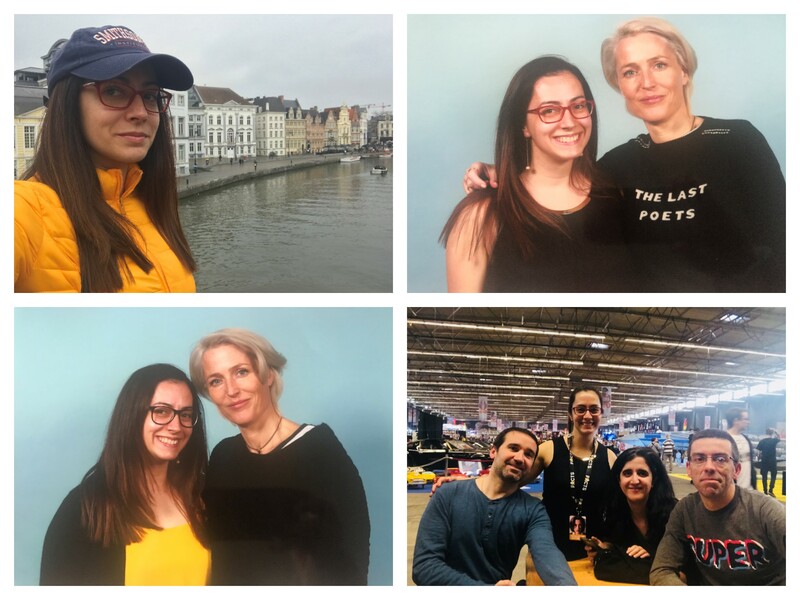 I loved spending these days with them but the main reason I went to this Comic Con was to have a chance to meet Gillian Anderson. I already liked Gillian Anderson, but I left Belgium loving her! She is a very interesting person who has been focusing her energy in the fight for women’s rights and equality lately. She wrote a very interesting book called We – A Manifesto for Women Everywhere which I highly recommend. I am very lucky to have a signed hardback copy of it thanks to Mira Magdo from Obsessed With Mr. Darcy who was a sweetheart and offered it to me a few months ago, but the book is also available in other formats such as kindle and audiobook, if this is a theme that interests you, you should check it out. Gillian Anderson also wrote a trilogy called the EarthEnd Saga which is a thriller starting with A Vision of Fire and ending with The Sound of Seas but I don’t think you will like the genre. After returning from Belgium time flew by! I had a surgery scheduled for last week so I pretty much spent my time working hard trying not to leave any pending items for my colleagues in the office, and before I knew it, I was already home recovering from the surgery. The first days have been a bit rough, and I’m still recovering, but I’m keeping positive thinking that the worst has passed and that it can only get better from now on. Girls please contact me at ritaluzdeodato at gmail dot com so we can send you your prizes. Until next time….Happy reading everyone! Yes, you did have a busy month. Neat that you got to travel, see friends, and go to Comic Con. How fun that Gillian was all that you could want and impressed you more in person. Didn’t know you were having surgery, but I’m glad it went well and recovery is going well, Rita. My son-in-law goes to Comic Con every year. He and my daughter are very active in gaming. He has created a board game which gained some recognition. Congratulations to the winners. Hope they enjoy their prizes. Heal quickly, Rita. Sorry you had to have surgery, but glad it’s over. Hope your recovery goes well. Glad you were able to travel to Comic Con and got to meet your hero… what fun. Your photos are amazing… as usual. Thanks for this post and congratulations to the winners. Glad to hear that your surgery went well. Hope you feel a little stronger with each passing day and that before you know it,you feel like your old self again!! Delighted to hear you got a chance to meet up with a lady you admire so much! It must have been so fantastic to chat with Gillian and have some photos taken. Thank you for sharing them with us. Thank you for the good wishes Mary!! !